A new World of Warcraft cinematic, Old Soldier, was released last night ahead of the game’s new expansion, Battle for Azeroth, which releases later this month. And while the video is clearly intended to have wider-ranging relevance within the game’s ongoing narrative, it’s also served to offer World of Warcraft a new fan-favourite character. Enter ‘Zappyboi’. Technically, this new people’s champion is called Zekhan, but that’s not important. 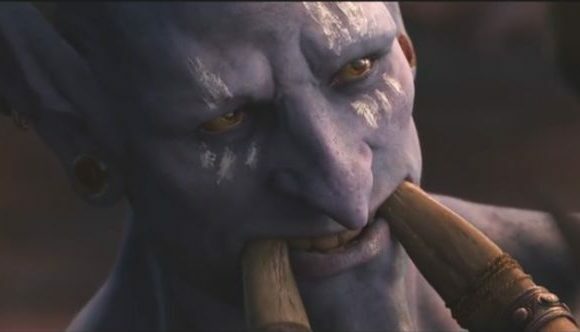 The young troll first appeared in the Battle for Azeroth cinematic, where he caught fans’ attention, but he plays a much bigger role in Old Soldier, as the Horde prepare for the Battle of Lordaeron. To put everything into chronological order quickly, we need to return to last week’s video, which documents the Burning of Teldrassil. In the video, Horde Warchief Sylvanas Windrunner orders the destruction of the Night Elf World Tree, sparking the events of Battle for Azeroth. Several days later, we have Old Soldier, in which Orc leader Varok Saurfang relives the dishonor heaped on the Horde by Sylvanas’ actions, as well as the death of his son, Dranosh. As Varok watches the Alliance approach from the walls of Lordaeron, Zekhan appears and the two strike up a one-sided conversation. Zekhan looks up to Varok, having heard tales about him from his father. Varok’s clearly not interested, however, and sheds his armor, planning to go out to face the Alliance alone, to win the death in battle that he craves. Zekhan’s not having that, however, and follows Varok down onto the battlefield to convince him to join the battle properly. The two head back up to (hastily) reapply their armor, as the Horde prepare for battle. A few moments later, we’re lead to believe, the Battle for Azeroth reveal cinematic begins, and both Zekhan and Varok can be found on the frontlines, alongside Sylvanas. Zekhan features a lot in the trailer, which is surprising for a character who didn’t even have a name until WoW’s cinematic project director Terran Gregory tweeted about it earlier today. That’s probably why the character was noticed in the first place, but since the latest trailer dropped he’s become something of a celebrity within the community. The World of Warcraft subreddit is alight with Zappyboi memes (my favourite is right here), while hordes of players are creating new characters based on the new cult of Zekhan. The Battle for Azeroth release date is August 14, so maybe we’ll actually get to meet Zappyboi soon. Meanwhile, you can watch all three relevant trailers (in their narratively chronological order) in the three videos above.